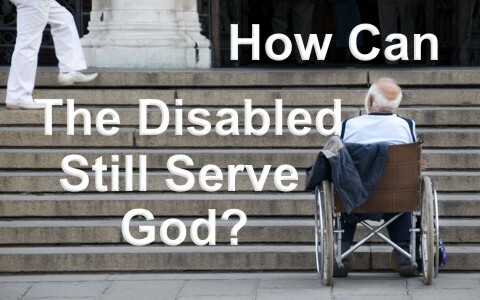 How Can The Disabled Still Serve God? How can a disabled person still serve God while living with a disability? To begin with, disabled people are very much like the rest of us. We’re all broken. The brokenness came in the Garden of Eden. When Adam and Eve disobeyed God and took from the Tree of the Knowledge of Good and Evil they died that day, if not physically, at least they experienced a spiritual death. After that point, we were all like the psalmist who wrote, “I was brought forth in iniquity, and in sin did my mother conceive me” (Psalm 51:5) since the “wicked are estranged from the womb; they go astray from birth, speaking lies” (Psalm 58:3), so “all turned aside; together they have become corrupt; there is none who does good, not even one” (Psalm 14:3), meaning “None is righteous, no, not one” (Rom 3:10). The Bible tells us that “no one seeks for God. All have turned aside; together they have become worthless; no one does good, not even one.” (Rom 3:11-12), so we are all disabled in many ways and as fallen creatures we all need the restoration of God by His Spirit. Only God can give us a new heart (Ezk 36:26) and create us as new beings in Jesus Christ (2nd Cor 5:17). A few years ago one of our elderly church members broke her hip and since she was in her late 80’s she was not able to recover and had to live out the rest of her days in a nursing home. This broke her heart, because before this, she was so faithful in giving and in attendance and participating in all of our church activities. I could tell that this really hurt her deeply because she could no longer worship with us and serve in the church, so she asked me, “What can I do? I’m in a wheelchair!” My answer probably didn’t help her much at the time but I said, you can pray. Praying is not the least of things she could do, but I told her, it was the most important thing she could do. I told her we can’t do anything significant without prayer and prayer is vital to us individually and as a church, so she started praying for specific things for our church, but she also prayed for me in my pastoral ministry. I asked her to pray for me and for the church and she did, so her life still had meaning and purpose. It didn’t’ matter if she was now disabled. We can’t do anything without prayer and I told her, we can do more with her praying for us than we can without her praying for us…and I really believe that. I believe one of our greatest resources in the church is the elderly. While most of the world sees the usefulness of the elderly as something that doesn’t exist, this is far from the truth. It said of Moses that he “was 120 years old when he died. His eye was undimmed, and his vigor unabated” (Deut 34:7), and in the latter years of Joshua, he said, “I am still as strong today as I was in the day that Moses sent me; my strength now is as my strength was then, for war and for going and coming” (Joshua 14:11). There is no such thing as retirement in the Bible. We retire when God says we retire, and that comes on the day of our death. There are many things that the elderly can do, even if they’re disabled. For one thing, they have so much experience and biblical wisdom that it’d be a shame to waste it. The Apostle Paul told Titus that “Older women likewise are to be reverent in behavior, not slanderers or slaves to much wine. They are to teach what is good, and so train the young women to love their husbands and children, to be self-controlled, pure, working at home, kind, and submissive to their own husbands, that the word of God may not be reviled” (Titus 2:3-5). The elderly have so much in life that they’ve learned that it would be a sin to waste this knowledge. Sometimes people become disabled due to age but God sees “the splendor of old men is their gray hair” (Prov 20;29), so I guess I have plenty of “splendor,” since I have a copious amount of gray hair, but disabled people have been to the school of hard knocks and learned some valuable lessons. It would be a shame to waste all that knowledge and experience. For sure, the disabled can serve God by praying to God, as I mentioned before about our elderly church member who now lives in the nursing home. She was in a wheelchair, but this woman was a prayer warrior like few others I’ve ever met. This godly woman who used to attend our church has a head full of biblical knowledge that she can share with the younger men and women, making her a valuable resource to the church. Moses, who was reluctant to go to Egypt to speak before Pharaoh said I cannot speak well, but God asked him, “Who has made man’s mouth? Who makes him mute, or deaf, or seeing, or blind? Is it not I, the Lord” (Ex 4:11), so “the parts of the body that seem to be weaker are indispensable” (1st Cor 12:22) to the church. Every person in the church has been gifted and these gifts do not cease with age. There is no point in a person’s life when they are no longer useful to God or the church. The only time we are finished with helping God on this earth and the brothers and sisters in Christ, are after we’ve drawn our last breath, so if you are breathing (I assume you are), then God is not finished with you yet. It doesn’t matter to God if you’re disabled or not. God is the One Who enables the disabled and the rest of us too. If you have a disability, you can find creative ways to serve God. You can pray, first and foremost, for the work of the kingdom. You can give us the benefit of your life experience and knowledge. You can help the younger people in the church by sharing your education from the school of “hard knocks.” You can stuff envelopes, write letters to prisoners or shut-ins, witness to the lost, hold Bible studies, and love others so that they would know that you are Christ’s disciple (John 13:35). Don’t sell yourself short. God doesn’t, and neither should any of us. Another excellent article! Truly, thanks for all you do and have done. Next post: Does Free Speech Protect Street Preachers In Preaching The Gospel?